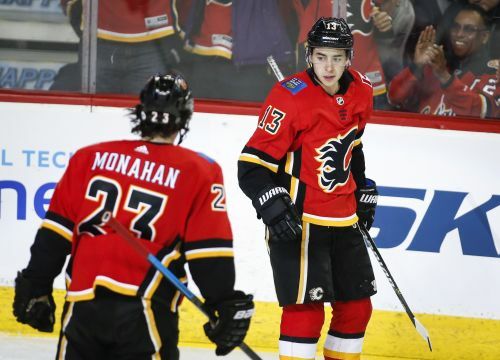 CALGARY, Alberta (AP) — Johnny Gaudreau had three goals and three assists, and the Calgary Flames scored six times in the third period on their way to a 9-4 victory over the New Jersey Devils on Tuesday night. PITTSBURGH (AP) — Sidney Crosby scored twice during a furious second-period rally and Evgeni Malkin picked up two assists to reach 1,000 career points, leading Pittsburgh to the win. Crosby picked up his 32nd and 33rd goals during a three-goal outburst over a span of 1:48 as Pittsburgh erased a two-goal deficit to take the lead on its way to snapping Washington's seven-game winning streak. Jake Guentzel started Pittsburgh's comeback with his team-leading 35th of the season. Phil Kessel and Jared McCann both added a goal and an assist for the Penguins, who have won six of eight. Jakub Vrana scored twice for Washington, and defenseman John Carlson collected his 11th of the season. Alexander Ovechkin picked up an assist to become the 48th player in NHL history with 1,200 career points. MONTREAL (AP) — Carey Price made 20 saves and became the winningest goaltender in Canadiens history. It was win No. 315 for Price, snapping a tie with Hall of Famer Jacques Plante atop the team leaderboard. Max Domi had two goals and Brett Kulak also scored as the Canadiens (37-26-7) stopped a two-game slide. Tomas Tatar had two assists against his former team. COLUMBUS, Ohio (AP) — Boone Jenner scored three times for his first career hat trick, powering Columbus to the win. The Blue Jackets scored five unanswered goals to go up 5-1 before the Bruins came roaring back with three straight in a wild second period. Zach Werenski's first goal in 30 games provided Columbus some breathing room, and Jenner's empty-netter completed his hat trick with 47 seconds left. Werenski and Josh Anderson each had a career-high four points on one goal and three assists. The Blue Jackets had lost four of six, but remain in contention for a wild card in the Eastern Conference. Brad Marchand had two goals and an assist for Boston, and Patrice Bergeron finished with a goal and an assist. The Bruins stayed in second place behind Tampa Bay in the Atlantic Division. WINNIPEG, Manitoba (AP) — Joe Pavelski scored with 4.3 seconds left, lifting San Jose to the victory in a matchup of division leaders. Gustav Nyquist had two goals for San Jose (43-19-8), giving him three in his six games since being traded to the Sharks in late February. Marc-Edouard Vlasic and Marcus Sorensen also scored. Aaron Dell made 21 saves as San Jose remained undefeated in March with its sixth straight win. Mathieu Perreault had a goal and an assist for Winnipeg (40-25-4), which dropped to 12-5-2 against the Pacific Division this season. Andrew Copp, Bryan Little, and Kyle Connor also scored, and Connor Hellebuyck stopped 31 shots. ST. LOUIS (AP) — Richard Panik and Vinnie Hinostroza scored to help Arizona to the road win. Darcy Kuemper made 39 saves just one night after he allowed four goals on 16 shots before he was pulled during the second period of Arizona's 7-1 loss in Chicago. He has won 10 of his last 12 starts to improve to 23-16-5 this season. The Coyotes have won 12 of 16 to move one point ahead of Minnesota for the final Western Conference wild card. Jaden Schwartz scored for St. Louis, and Jordan Binnington stopped 19 shots. BUFFALO, N.Y. (AP) — Ben Bishop made 35 saves for his third straight shutout, leading Dallas to the victory. Rookie Roope Hintz scored twice for Dallas in the opener of a two-game trip. The Stars have won five of six and remain on top of the Western Conference wild-card standings with 77 points. Linus Ullmark stopped 25 shots for the Sabres, who have lost five in a row. ANAHEIM, Calif. (AP) — Anaheim's Daniel Sprong scored for the third consecutive game. Ryan Getzlaf and Jakob Silfverberg also scored for the Ducks, who have won four of their past six games. John Gibson made 32 saves. Filip Forsberg scored two power-plays goal for the Predators, who have lost two straight and four of six overall. Pekka Rinne made 15 stops. Nashville remains one point behind Winnipeg for first place in the Central Division. The Predators lead St. Louis by four points for second place.